From a conventional theoretical perspective, brand identity (BI) and brand image (BIm) are two distinct notions: BI originates from its internal stakeholders (e.g., managers) and is defined as a stable and enduring concept, while BIm focuses on how the brand is perceived by its external stakeholders (e.g., consumers). Arguing that the development of the co-creation paradigm in branding demands a recasting of brand management, this paper revisits the conventional theoretical notions of BI and BIm and their reciprocal relationship. 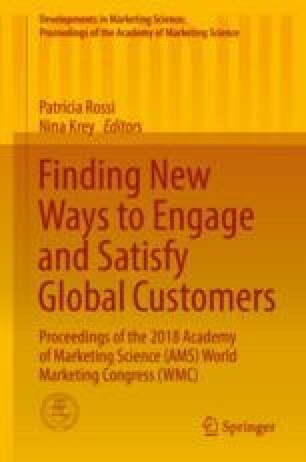 In this research, we take a restricted view of co-creation by assuming that co-creation in branding can only occur under specific conditions supported by previous research: (1) evidence of direct interactions between brand managers and staff and consumers; (2) brand managers should ensure access to information to consumers; (3) consumer active participation in the process of brand management; (4) the co-created brand must be perceived by consumers and managers as affecting their identity and personal life, which implies a collective acceptation by both parts of the risks intrinsic to the brand. Under such context, we propose consumers as internal brand stakeholders. Drawing on a seminal theory on identity in sociology, we present preliminary insights from a longitudinal case study investigating the brand management of a leading brand in the postgraduate higher education sector selected in accordance with the foundational prerequisites of brand co-creation exposed above and from the perspectives of both managers and consumers. The research covered a period of 4 years and included among multiple sources of evidence, 67 in-depth semi-structured interviews with 42 informants, mostly internal brand stakeholders—i.e., managers (e.g., managers, faculty, and staff) and consumers (e.g., students and alumni). Findings suggest that BI management develops as a corrective process that entails managers’ and consumers’ co-engagement in addressing brand issues. A brand issue for consumers becomes an issue for managers, and brand issues are addressed by both parts in order to project a favorable image of the brand to outsiders. Managers and consumers co-engage in BI management because they are concerned with how outsiders will perceive the brand and by implication themselves, as internal brand stakeholders. This leads to the conclusion that, within a context of co-creation, BI and BIm are reciprocally and recursively connected.